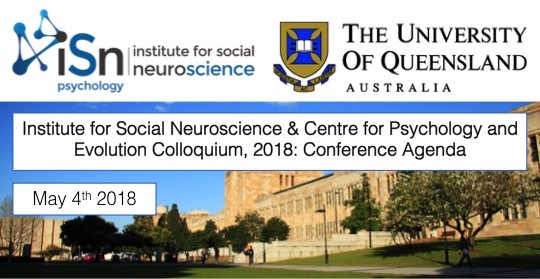 On the 4th of May 2018 we held the inaugural ‘Institute for Social Neuroscience and Centre for Psychology and Evolution Colloquium’ at the University of Queensland. I was the lead organiser of the one-day conference, which bought together experts studying cognition from an evolutionary perspective from around Australia. It was my first time organising a conference, and I think it was a success. We had talks covering rituals and symbolism, social behaviour, mortality and cooperation, psychopathology, mate choice – all of which can be seen as expressions of an evolved psychology. We were lucky to be joined in the endeavour by many great guests from outside of the University of Queensland – including from Griffith in Brisbane, the Institute for Social Neuroscience in Melbourne, Murdoch University in Perth and Western Sydney University. The conference was highly multidisciplinary, involving clinical, developmental, social, evolutionary, and cognitive psychologists as well as archaeologists. Archaeologists Dr Michelle Langley and Associate Professor Adam Brumm from the Australian Research Centre for Human Evolution at Griffith University presented fascinating work on human symbolic behaviour using Southeast Asian and Australian evidence. Leah Sharman presenting an interesting in-depth analysis of the functions of crying. Find out more about the Institute for Social Neuroscience, and the Centre for Psychology and Evolution.